I never used to think of my chosen profession as one that was particularly life-threatening, but after seeing several reports and watching Jon Stewart’s Rosewater, I am beginning to wonder. Granted, I am not a war reporter or looking to go to some hot-spot and report on the latest human rights abuses. But neither is Sarah Lacy, who recently got a personal threat with her Uber coverage. The Committee to Protect Journalists reports that so far this year 42 journalists have been killed, and last year hundreds more were put in prison, including 40 of them in Turkey and one here in the US (for not revealing sources). But it turns out I don’t have to travel to some foreign land to get into jail, or to see some abusive police behavior first-hand. The Pen American chapter recently studied the events in Ferguson, which is about ten miles away from my house. They have found 21 people who have been arrested over the past several months. And while all of them have been released within hours or the next day. many of these reporters were threatened with tear gas or bodily harm in the process of doing their jobs.That’s not good. 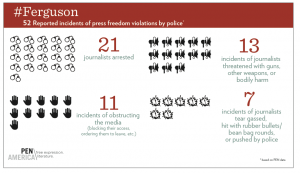 The Pen report describes each circumstance with as accurate reporting as they can. Many have already been mentioned in the various online and print media stories about Ferguson, but it is good to have all of them collected in one place to give a better picture of the situation. Here is a summary infographic of the various events that they have extensively documented. I would like to give the police the benefit of the doubt, because I have seen reports that they were under siege themselves with live gunfire and gasoline-filled bottles thrown at them from various demonstrators. But still, the Pen report brings up some interesting and troubling issues. While some of those arrested were “citizen journalists,” it might be hard for the police to differentiate between an accredited journalist and just someone with a cell camera that has his or her blog, Vine account, and Twitter stream. But then, many who were arrested were professionals. How to explain the situation involving two Al-Jazeera America cameramen? They had to abandon their filming due to tear gas thrown right under their tripod. Or two reporters who were sitting in a nearby McDonalds trying to file their stories? In both situations, the police later claimed they were in danger, but it seems the only danger was the situation the police themselves created. Ferguson is such a heartache on so many levels: to see a town that is trying to do so many good things hurt by looters and mob rule. To see the quick escalation of police into combat mode that we normally associate overseas. To see an unarmed citizen killed in the middle of the day. And to see journalists that have to defend themselves because they are just trying to bear witness to what is going on. Rosewater documents a true story about a Canadian/Iranian journalist for Newsweek Maziar Bahari who was imprisoned for three months on the charges that he admitted he was a spy on network TV. However, the admission was tongue-in-cheek as part of an interview on the “Daily Show.” The movie is well worth watching, and is based on his book that he wrote about his experience. If we are going to be a shining example of a working democracy, we need a strong and independent press that can document police abuses. Otherwise, we are no better than the countries we criticize for trumped up charges and wrongly arresting people. Thank you David for a well written piece. Without journalism, there could be no democracy. On the scene reporting contributed immensely to the positive social change generated by the civil rights movement. We are all hoping for peace in the coming weeks in Ferguson.